As I wonder through the old town in San Sebastian, all of my senses are pleasantly confronted by food. First it is the sight of the cobbled streets – so different to anything we have back home in modern Sydney. Then its the sound of glass chinking, old friends greeting each other, new friends getting to know one another as they spill into the streets. Through the open doorways of each little pinxtos bar wafts the smell of seafood, olive oil, cured meat and garlic… oh so much garlic. I am drawn in, passing the crowds, carefully not stepping on any of the food and napkins that are on the floor as I head straight to the bar. The barman greets me with a smile asks for my drink order, handing me a plate while still pouring a drink for someone else. I move along the bar and goggle at all of the delicious fresh food that is on display. Gingerly at first I reach out to grab a colourful combination of meat, cheese and olives all skewered onto a piece of fresh white bread. Soon, I have a couple of different pinxtos on my plate and my drink has arrived. I move off to the side and finally my sense of taste gets taken out for a spin, slowly savouring the fresh ingredients which have been tossed in olive oil and garlic. Some have been cooked, but most are cold… which is more traditional to the region. I finish my plate and drink and grab the bill, somehow the barman knew exactly how much I had eaten. I move back into the street wandering around until a new place pulls me in to try something different! 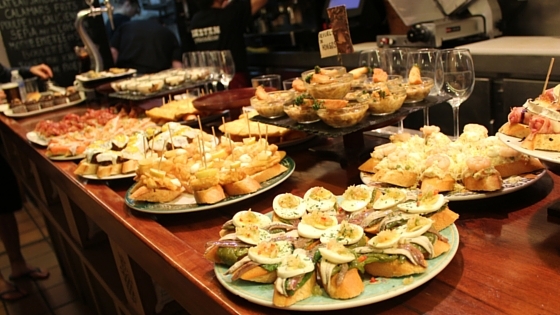 Pinxtos should be a snack or entrée before the main meal, people will often meet in a pinxtos bar for a drink and entree before heading out to dinner. After a couple of days the lure of the pinxtos bars has started to wear off, I no longer feel the need to gorge myself on every morsel I see. Instead I adopt a more Basque attitude to them – meeting some friends in one of the bars for a quick drink and bite to eat before we head back to my AirBnB for some dinner. The AirBnB I booked in San Sebastian was one of my favourite accommodations to date… however, remember that AirBnB is best for small groups or couples if you have a backpackers budget. 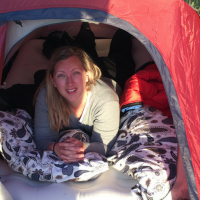 This place could sleep 4 with comfort – which made it a great place to share on a budget. One of the other great things about staying in an AirBnB place is that the kitchens are generally (not always though) better stocked with the essentials like olive oil. 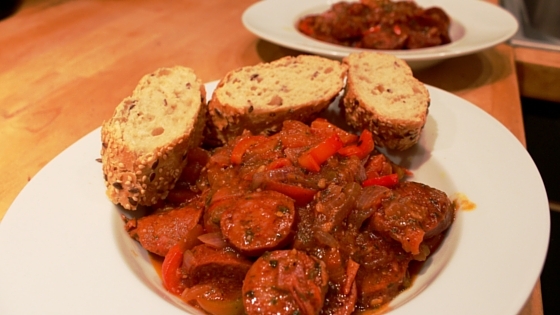 Which was how I was able to throw together this easy and tasty Basque Style Chorizo Stew. All of the ingredients were bought at a little market just round the corner from the place I was staying and were fresh but cheap. By getting there early I was able to get the bread so fresh that it was still warm. 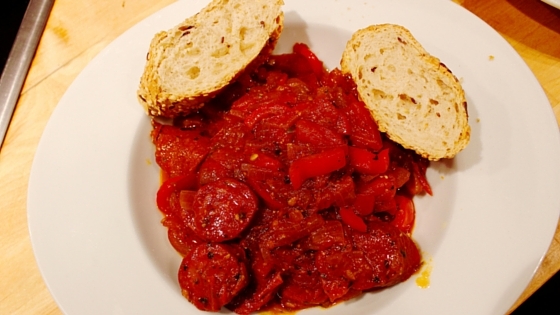 Also, it’s good to note that Basque chorizo is a little bit spicy and is traditionally best for stewing – facts I learnt on my San Sebastian Cooking Class. Gently cook the red onion and garlic. You don't want them to brown, just loosen and soften. 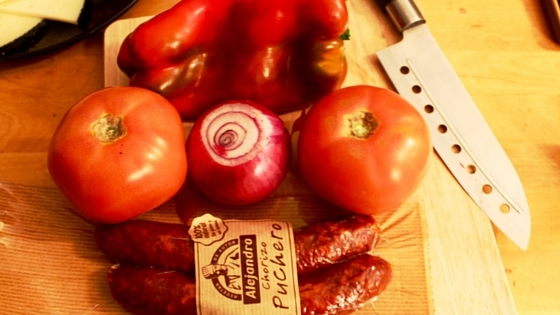 When soft, turn up the heat to just over medium and add in your chorizo. Brown lightly then turn the heat back down. Throw in your tomatoes, capsicum and season with salt and pepper. Leave covered for 5-8 minutes. Remove lid and add in half the wine, let it gently simmer down for 5 minutes then add the rest of the wine and repeat. 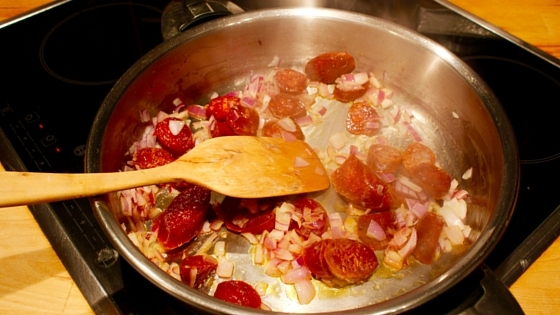 After another 5-8 minutes most of the liquid should be gone and the chorizo should be soft. If there is still liquid, just simmer for a little longer.